This garlic crusher has a very unique design. You may have even seen it being used on some popular tv shows! The chopper is simple to use, simply place a peeled clove on a cutting board and rock the garlic crusher right on top of it. The garlic will be minced and pushed through the device where it can simply be scooped off with a spoon and added to whatever you are cooking. This ranks at the top of out list because it is an elegant solution with no parts to break and best of all it’s easy to clean. This little guy is not only a fun gadget to have around the kitten but its very functional. It’s simple to use, just place a close into the snap together clear case and roll the wheels back and forth along any surface. It does a find job of chopping and you can get different consistences depending on how long and quickly you roll it. 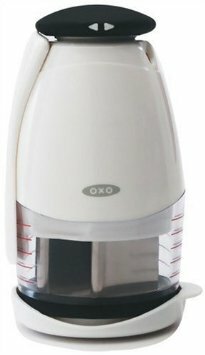 It has a very sharp stainless steel blade that slices through the garlic with ease and is removable so cleaning is a bit quicker. One of the only downfalls to this product is that it does have a few moving parts that may wear out or break over time. For the price this is a neat and effective tool. This inst exactly a chopper but it does get the job done. 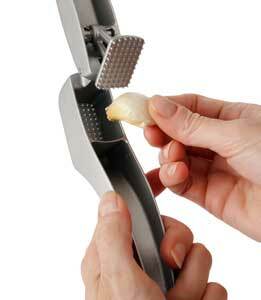 The Zyliss Susi Garlic Press is a good alternative to a chopper. 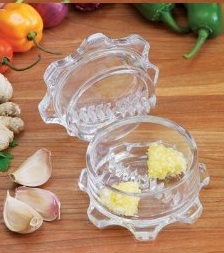 It takes care of mincing garlic by forcing an entire clove through a pattern of small holes. This breaks up the clove and makes it into small pieces in one shot. One convenience about this press is you can add an unpeeled clove and the skin will not make its way through the holes. It might take a little more strength than the other choppers on the list but it can put the garlic where you need it in one move. 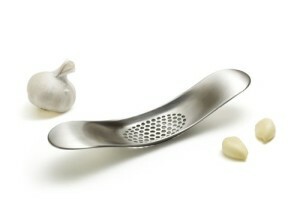 This is yet another style of garlic chopper that works extremely well. 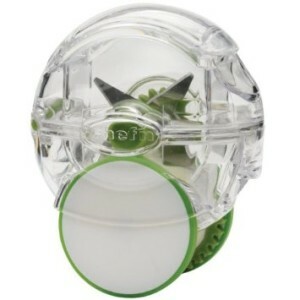 The NexTrend Garlic Twist works by trapping a clove of garlic between two sets of counter rotating sets of plastic blades. As you twist the device back and forth you are able to mince up a clove in no time to any consistency you desire. This devise is a little bit harder to clean than some of the others because garlic gets stuck between the blades, but it does come free with a good rinse while the garlic is still fresh. This chopper is just like slap chop or other similar style choppers you may have seen. It has retractable spring loaded blades that will chop each time you push the plunger down. The blades also rotate so each push is sure to chop a new peice. One good thing about this chopper is that it is a little larger and you can fit more than just garlic in it. It works great but has many parts and is a little tough to clean thoroughly but it still makes our list.